GoodBites Raw Vegan Curry Cashews - 1.0 ounce Packs - Case of 12 by Goodbites at Smokey Robinson Foods. Hurry! Limited time offer. Offer valid only while supplies last. Sweet, savory, and just a tad spicy, these nuts have a flair for the exotic. Notes of cayenne, curry, and maple syrup will transport your taste buds. Sweet, savory, and just a tad spicy, these nuts have a flair for the exotic. Notes of cayenne, curry, and maple syrup will transport your taste buds. Crunchy, but still alive! 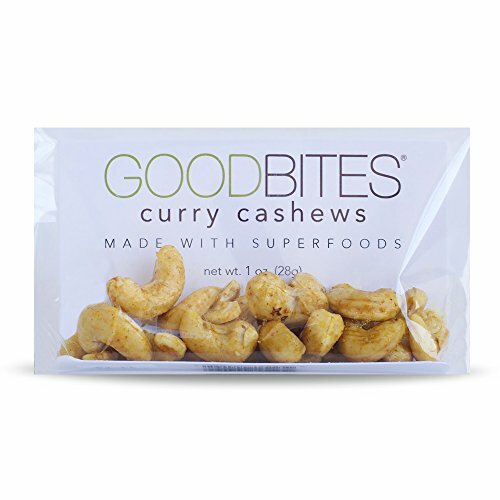 Goodbites® Curry Cashews are Superfood-and super GOOD-treats that will satisfy your between-meal cravings, without the guilt or the crash. Made entirely of raw, organic, vegan, gluten-free, and non-GMO ingredients. Perfect for on-the-go snacking. Comes with 12 packs of Curry Cashews. Perfect for on-the-go snacking. Martha Stewart American Made 2015 Finalist. Sweet, savory, and just a tad spicy, these nuts have a flair for the exotic. If you have any questions about this product by Goodbites, contact us by completing and submitting the form below. If you are looking for a specif part number, please include it with your message. Candymax-Blanched Roasted Almonds 5 lb-5% off purchase of 3 any items, !